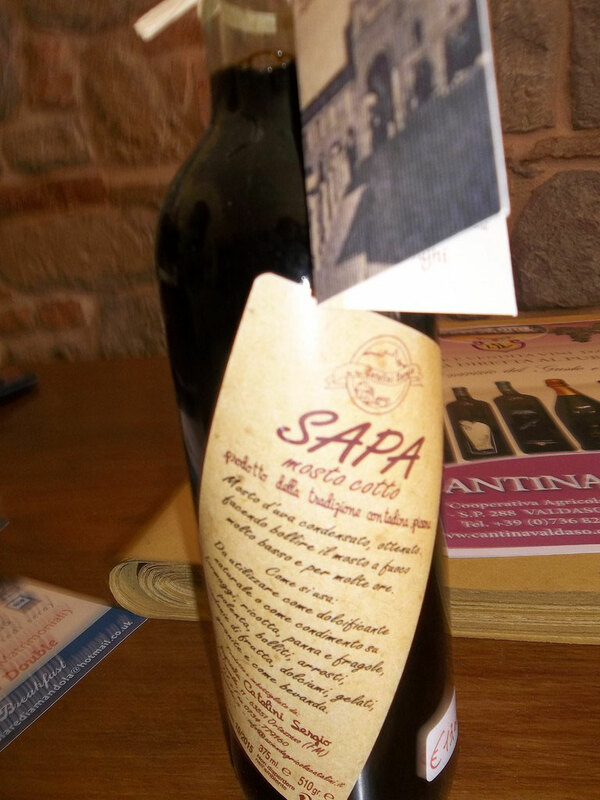 A friend recently told me he had bought a bottle of Sapa from the new shop in Amandola run by the Anessi family (see my blog, Amandola has a new shop of 10 June, 2013)). I'd never heard of Sapa and was interested to find out more, particularly as our friend said it was delicious. I have discovered that it is a condiment, typical of Marche, Emilia Romagna and Sardegna, used a lot by the contadini (peasant farmers) in the "old" days. It's a thickish syrup made from the mosto (unfermented grape juice) of either white or red grapes. It was used as a sweetner in cakes & sweets as well as to improve dishes such as polenta. Our friend ate it with some cheese and loved it.